With THQ's recent bankruptcy, its many popular properties were split up for auction. Meanwhile, some older properties that had been laying fallow were also found and sold. Among the pile of detritus were rights to the classic space simulator Freespace. Interplay, the original publisher of the franchise back in the late 90's, has reacquired the Freespace rights for a paltry $7,500. To put that sum into perspective, Gearbox recently acquired the rights to Homeworld from THQ as well. It's rumored that their winning bid was $1.3 million, which handily beat out the crowdsourced Save Homeworld project. At $7,500, it almost makes me wish I'd have taken out a loan and snapped it up myself. 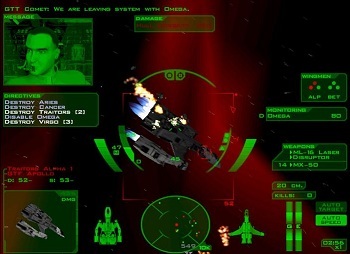 Volition developed Freespace, back before they made their name with Red Faction and Saints Row. It was published by Interplay, who also published classics like Baldur's Gate and Fallout. Despite that success, Interplay vanished for years, with only a few lawsuits to show signs of life. Now with a fully functional website and some of their old IPs back, perhaps Interplay's making a comeback. Currently, both Freespace games are up for sale on GoG, DRM-free.